There are certain things that we, as readers, have grown to expect from poetry. For the most part, these things center on an unabashed honesty from the poet, a transformation of ourselves in light of their words, and most importantly a revelatory portrait of the world in which we live. It takes special writers to be able to reach into themselves, expose their inner being, and display it in text for the world to judge. Whenever a poet can tap into a universal stream of consciousness and reveal things about reality that connect with their reader, it’s in our best interest to take notice. 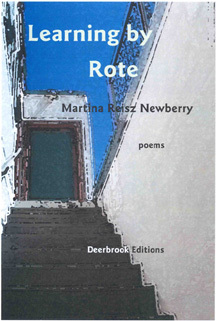 In her latest collection of poems, Learning By Rote, Martina Reisz Newberry accomplishes all of these things. From the initial read, to a more careful examination of her verse, Newberry’s words continuously undressed my own personal dogmas and steadily draped them in a more brilliant and genuine perspective. Much like Dante’s Virgil, Newberry becomes a personal, poetic guide, and allows her voice to lead the reader through the various realms of consciousness towards a purer state of being at the end. With each turn of the page, her poems seem to touch on another layer of life and ultimately force the reader to examine themselves through a lens different from their own. She embraces the unknown and carefully asserts an interpretation of her own life experiences in a way that makes you reflect on your own. It is the subtle beauty of her words that causes a stirring. She speaks both humbly and authoritatively about what she sees, and allows us to accompany her in the transformation of our personal psyches. With these poems we find that it is okay to question ourselves. In fact, it is the questioning and prodding that burns the chaff, revealing what lies beneath. Newberry lays her struggles out before us, and meets us on a plane where we all lie exposed – our true selves. In her poems, the whole of human reality is recognized, both vice and virtue, and society is placed down for judgment and repaired in the eyes of the reader. Newberry uses a genuine language, the purpose of which is to expose myths, false idols, and futile lives, and points it directly at the misguided placement of importance in our culture. She uses lines such as: “Politics is a meaningless famine; it gives us / the necessary vocabulary to discuss our new myths,” and “Nothing says “I love you” / like digital letters on a trendy Iphone. / Nothing says, “I’m lonely” / like a computer screen.” She quickly asserts herself as an American prophet, and opens our eyes to the pending destruction our habits provide. However, unlike the judgmental prophet, she let’s us know that we are in it together. “But, through our mutual / drug-induced sanity / we might hold hands, / compare notes, / and leap tall buildings / in a single bound” (In The Night Kitchen). One of the most stunning parts of the collection is the second section, a series of six poems based on photographs from a book of photojournalism entitled “Eyewitness.” In this section, Newberry further displays her brilliant ability to stream past the outer layers of the person, and cut straight to their core. In the first poem, she writes of soldiers and states, “They’re not thinking of Sherman or / his damned march. They are tired, thinking ‘home, bread, strew.’” In our society where we tend to see a larger picture of events, but Newberry recognizes the great humanism of our generation. She extorts our inept violence, and places our idols on the stand for their corruption. Newberry’s heart is with the people, her love is with the individual, and her life is mixed together with us all in a beautiful tale of existence. Review submitted by @TripStarkey. To read Trip’s other reviews, click here.  Archived in Literary Randomness and tagged literature, poetry, writing. Bookmark the permalink.